Edward “Chick” Davis (1907-2006) was a prominent African American billiards player in the mid-twentieth century. Born in South Philadelphia, Davis learned to play billiards at the Christian Street YMCA, the first black YMCA in Philadelphia. At the time billiards parlors and championships were segregated, as was much of American society. Black players had no opportunity to compete in national championships or against the top players of the day. 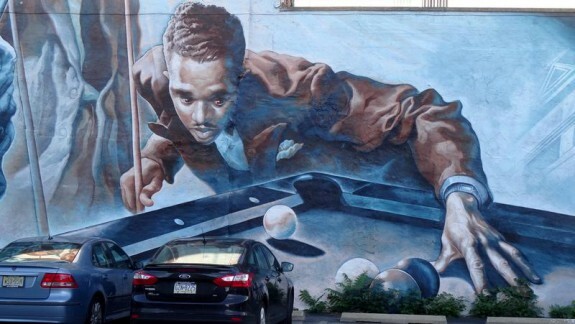 Having experienced discrimination when he toured the country playing billiards, Davis opened a billiards parlor at Broad and Bainbridge Streets that was welcoming to all players regardless of race or gender. He later owned two other billiards parlors, one on Broad Street and one on South Street. 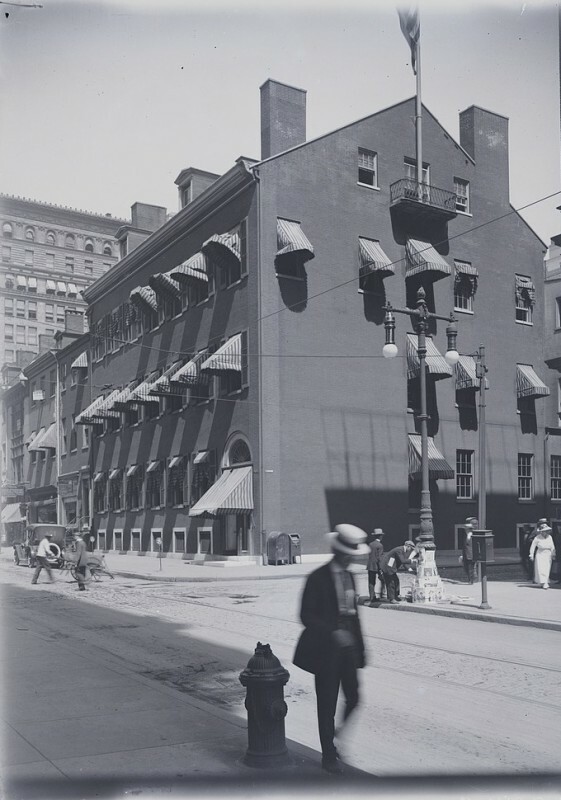 The Philadelphia Club, shown here in 1916, is the oldest city club in the United States and one of the oldest traditional gentleman clubs. The Philadelphia Club was founded in 1834 and met in various locations until 1850 when the club permanently moved to its current location at 1301 Walnut Street. 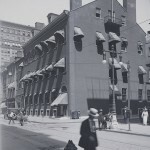 At the time of the move to 1301 Walnut the club added a billiard room, becoming the first men’s club in Philadelphia to offer billiards to its members. Willie Mosconi is considered to be the second-best billiards player of all time and the best straight-pool player. Mosconi began playing at a very young age at his father’s billiards parlor in South Philadelphia. Between 1941 and 1957 he won fifteen consecutive championships. Straight-pool matches were played until one player reached a certain number of points, one point being given for each ball pocketed. Matches were usually played over several days to scores of several hundred points. Mosconi holds the all-time documented record for balls continuously pocketed without a miss—526, achieved in an exhibition match in Springfield, Ohio, in 1954. Under the sponsorship of Brunswick, Mosconi toured the country promoting what he always called pocket billiards. He was the technical advisor for the film The Hustler (1961) with Jackie Gleason and Paul Newman (and said to have made Newman’s trick shots), which increased the popularity of pool in the United States. By the mid 1800s, the more-affluent members of Philadelphia society were playing billiards in exclusive men’s clubs while working-class men played billiards in taverns and saloons. There was sufficient interest in billiards in Philadelphia by 1858 for the city to be the location of the first informal American billiards championship. Other national championships were held in the city in the first decades of the twentieth century. By the 1930s there were over 200 billiards parlors in the city. 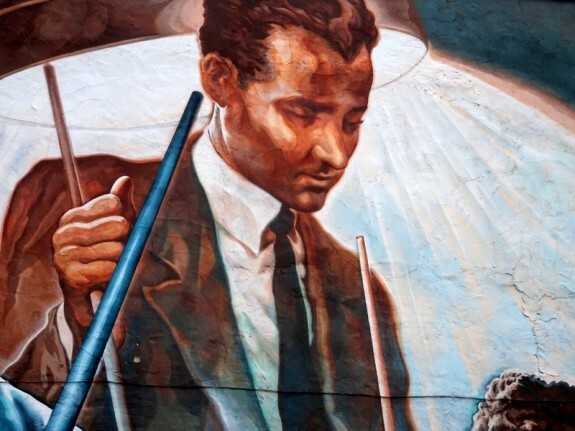 All the nationally prominent billiards players of the time played in Philadelphia and some lived in the area, including Willie Mosconi (1913-93), who is considered to be the second-best billiards player of all time. The location and date of the origin of billiards are not really known. The game is thought to have originated in France or England in the 1400s as an indoor alternative to croquet. King Louis XI of France had a billiards table made in 1470. Shakespeare refers to billiards in Antony and Cleopatra (1606-09), suggesting that by that time billiards was sufficiently popular for the reference to be understood by his audiences. Billiards was brought to America by both the English and Spaniards. There are references to billiards being played in Virginia as early as 1710 and in New Orleans in 1723. George Washington played billiards with the Marquis de Lafayette in 1777. The earliest reference that has been found for billiards in Philadelphia is a 1793 notice of sale for the Black Bear Tavern in Southwark (Queen Village), which mentions that an adjoining building contained a large space intended to be used for billiards. This suggests that billiards may have been prevalent in taverns outside the city limits (Vine and South Streets), as were other forms of sports and entertainments frowned upon by Quakers and, therefore, not found within the city proper. By the early 1800s billiards had become popular in Philadelphia and most other major cities. Billiards parlors were respectable places, catering to the emerging urban middle and upper class. However, by the 1840s the association of billiards with gambling and other presumed associated vices led to a class distinction in the way billiards evolved and was experienced. The more elite members of society withdrew from public billiards parlors and either created billiards rooms in their own homes or enjoyed the game at exclusive men’s clubs. On the other hand, billiards continued to be a popular activity among working-class men, played primarily in taverns and saloons, but also in workingmen’s clubs and YMCAs. The first men’s club in Philadelphia to offer billiards to its members appears to have been the Philadelphia Club, which added a billiards room to its new facility at Thirteenth and Walnut Streets in 1849. Billiards was very popular during the Civil War period. Abraham Lincoln referred to himself as a “billiards addict” (as did Mark Twain). 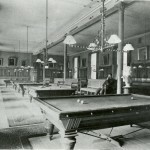 It is, therefore, not surprising that when the Union League opened its new building on Broad Street in 1865 there was a billiards room with four tables. The evolution and eventual decline of billiards at the Union League is a good indication of the rising and waning popularity of billiards among Philadelphia’s business and civic leaders. 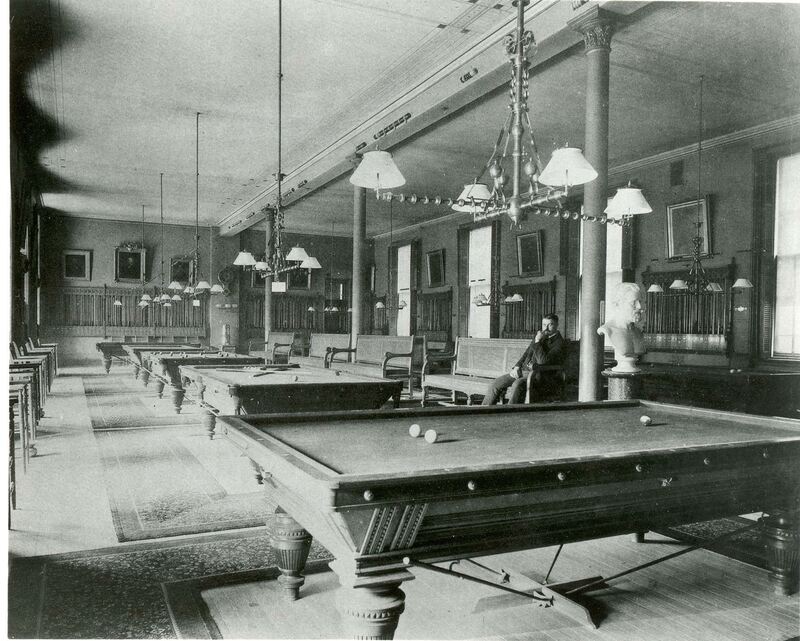 Initially, billiards was so popular at the Union League that in 1881 an annex was built solely for adding billiards tables. Another annex was built in 1891 for the same purpose. When these were demolished to make way for architect Horace Trumbauer’s 1911 addition, two rooms were provided in the new addition exclusively for billiards, each with twelve tables. In addition to hosting annual member tournaments, interclub tournaments, and exhibition matches, the Union League hosted the national championship in 1913. Yet by 1954 interest in the game among members had so declined that all of the billiards tables were removed. Parallel to the evolution of billiards in exclusive men’s clubs and professional championships was the continuation of billiards as a popular workingman’s game. Although billiards tables could be found in Philadelphia workingman’s clubs such as St. Timothy’s in Manayunk in 1877 and in YMCAs, the more popular venues were neighborhood taverns and saloons. These provided places where single men from Philadelphia’s Irish and Italian immigrant communities could congregate for both social and recreational purposes. Billiards was popular because it provided an opportunity to show skill, to be with friends, and to earn a little money through gambling. By the 1920s billiards tables were as essential to a successful tavern as the bar itself. For many of the same reasons, billiards also was popular in Philadelphia’s black community, even in the late nineteenth century. W.E.B. Dubois promoted billiards as a respectable game for the black community, and when black YMCAs began to emerge in the 1920s, most included billiards tables. Segregation prevented black players from playing in championships, which led to the creation of the Colored Billiards Players Association in 1914, although little is known of its history. However, as with other minority communities, the primary places for Philadelphia’s black residents to play billiards were taverns and saloons. From the 1880s to the 1930s, the most popular form of billiards was played with three or four ivory balls on a pocketless table. Now this is called carom billiards and is still popular in Europe and Asia, although much less so in the United States. Willie Hoppe (1887-1959) of New York is considered to have been the best carom billiards player in history and the best billiards player of all time. Between 1906 and 1952 he won 51 championship titles. Hoppe played an exhibition match at the Union League in 1933. Carom billiards was still the form of the game initially played by Ralph Greenleaf (1899-1950), considered to be the third-best all-time billiards player and its first real celebrity. Greenleaf dominated the game from 1919 to 1937, winning 20 championships. He played exhibition matches all over the Philadelphia area for $50 a performance. Greenleaf married a vaudeville star, Princess Nai Tai, who often appeared with him at his exhibition performances, contributing to his celebrity. In his day Greenleaf was as prominent a sports figure as baseball’s Babe Ruth and boxing’s Jack Dempsey. Billiards was initially limited to a game with three balls because ivory balls were expensive to produce. When synthetic balls were developed in England in the 1880s, the game changed to one played with fifteen balls on a table with six pockets. The championship form of the game became “straight pool,” and the dominant straight pool player was Willie Mosconi (1913-93) of Philadelphia, considered to be the second-best pool player of all time and the best straight pool player. Mosconi began playing at a very young age at his father’s billiards parlor in South Philadelphia. Between 1941 and 1957 he won fifteen consecutive championships. Straight pool matches were played until one player reached a certain number of points, one point being given for each ball pocketed. Matches were usually played over several days to scores of several hundred points. Mosconi holds the all-time documented record for balls continuously pocketed without a miss—526, achieved in an exhibition match in Springfield, Ohio, in 1954. Under the sponsorship of Brunswick, Mosconi toured the country promoting what he always called pocket billiards. He was the technical advisor for the film The Hustler (1961), with Jackie Gleason and Paul Newman (and was said to have made Newman’s trick shots), which increased the popularity of billiards in the United States. For a time, Mosconi owned a billiards parlor in the Logan section of Philadelphia, although he seldom played there himself. By the 1930s billiards was so popular in Philadelphia that there were a great many billiards parlors (as distinct from taverns or bars with a single billiards table) throughout the city. The 1920 City Directory has 230 listings under billiards and pocket billiards. 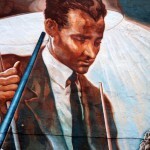 Although many were located in downtown Philadelphia, there were also well-known billiards parlors in Kensington, along Roosevelt Boulevard, in Germantown, and in South Philadelphia. The best-known billiards parlor was Allinger’s, founded around 1889 and located at Thirteenth and Market Streets from 1911 to the 1971. It initially contained three floors with over 100 tables. One floor had a special glass-enclosed area for top players so they could be seen performing without being bothered. “Rack girls” were available to rack your pool balls for a small tip. All the top national players played at Allinger’s at some point in their careers. Other well-known downtown billiard parlors were Frankie Mason’s at Seventeenth and South Streets, one owned by world champion Jimmy Caras on Chestnut Street, Harry Robbin’s at Fifteenth and Market Streets, and the Fox, at Sixteenth and Market Streets. 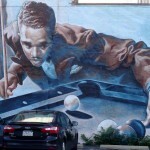 In his autobiography, Rudolf Wanderone Jr. (1913-96), popularly known as Minnesota Fats, lists many pool halls around City Hall where he played and, in a deposition for a lawsuit in the 1940s, Ralph Greenleaf listed nine places in Philadelphia where he regularly played or gave exhibitions. Later venues included the Cue and Cushion at Fifteenth and Walnut Streets and Newby’s at Eleventh and Chestnut Streets, owned by Earl Newby, a former Philadelphia police detective who started the first billiards magazine, Billiards News, in 1960. Longo’s Society Hill Billiards, which opened at Fifth and South Streets in 1932, was as prominent a billiards venue as Allinger’s. Phil Longo (1902-88) and his wife Mamie (1901-84) were both excellent players who won state and city championships. All the national champions played at Longo’s. Mosconi won a regional tournament there in 1933 that qualified him for the world championships. Local Philadelphians also frequented Longo’s, including George Kelly (a relative of Grace Kelly and a champion billiards player), mob boss Angel Bruno, and police sergeant (later police commissioner and mayor of Philadelphia) Frank Rizzo. In an interview in 1974, Phil Longo lamented the decline of billiards over the course of his life, noting that of the 200 billiard parlors that existed in Philadelphia in the 1930s, only 70 remained. Using the definition of billiards parlor Longo would have used, there were virtually none remaining in the city in 2015. The last true billiards parlor, Tacony Billiards, closed in 2013. Many of the top Filipino players of the late twentieth century practiced there each August for many years, including Efren Reyes (b. 1954), considered to be the greatest contemporary billiards player. Several traditional billiards parlors remain in the suburbs, including Drexeline Billiards in Drexel Hill, started by Bob Maidof, and Fusco’s The Spot in Trevose, owned by Pete Fusco—a fine billiards player in his own right and cousin of Jimmy Fusco (b. 1948) of Philadelphia. Known as “the Philadelphia Flash,” Jimmy Fusco is considered to be one of the great one-pocket billiards players. The combination of the popularity generated by the movie The Hustler and the introduction of coin-operated tables in the 1960s created a temporary boom in public interest. The popular form of billiards—by this time more commonly called pool—became 8 ball, first begun around 1900 but not really popular until the 1950s, partially as a result of the distribution of 15,000 billiards tables by the Army in the 1940s. While Newman’s second pool film, The Color of Money (1986), with Tom Cruise, gave a boost to upscale billiards parlors, bar pool remained the most popular and most prevalent form of the game. The longtime association of billiards and pool halls with gambling and as places for young men to hang out has often given billiards and pool a poor reputation. This was humorously presented in Meredith Wilson’s 1957 musical, The Music Man. One of its most popular songs, We Got Trouble, is about the dangers of playing pool and includes the line, “That game with the fifteen numbered balls is a devil’s tool.” This impression led to zoning laws restricting the location of pool halls. Even in 2015, Philadelphia’s zoning code classifies pool halls with multiple tables in the same category as adult bookstores and adult movie theaters and precludes their location within 500 feet of a residential property, unlike bars with one pool table that can be almost anywhere. In recognition of both the interest in and the primary location of billiards tables, the American Poolplayers Association was formed in 1979 and grew to 270,000 members in the United States, Canada, and Japan. The Philadelphia Chapter was founded in 1990 and in 2015 boasted 1,500 members playing on over 175 teams in bars throughout the Philadelphia area, testifying to the continuing attraction of billiards in the twenty-first century. John Andrew Gallery is an avid billiards player. He is a member of the American Poolplayers Association, plays on an APA team in Philadelphia, and has participated in Las Vegas, Chicago, Cleveland, and Cologne, Germany. He was the first director of the City’s Office of Housing and Community Development and executive director of the Preservation Alliance for Greater Philadelphia from 2002 to 2013. He is the author of several guidebooks on Philadelphia architecture, including Philadelphia Architecture, A Guide to the City (Third Edition, 2009). Buffalo Billiards, 118 Chestnut Street, Philadelphia. Drexeline Billiards, 5100 State Road, Drexel Hill, Pa.
Fusco’s The Spot, 4432 E. Bristol Road, Trevose, Pa.
Main Line Billiards, 490 Lancaster Avenue, Frazer, Pa.
pfister tables? if so at what pool halls in philly or wilmington de.